A few quick shots to show the glazed pieces I mentioned a few posts back. The blackbird slip is working pretty well. I need to mix up a new batch. I tried edging the rim with the slip and it flaked off and resisted the glaze in some areas. I like the look of the dark outline but have to figure out how to control the flaking. I may have waited longer than normal to paint in the slip design, so the underneath clay may have been drier that it should have. New problem solving required. I also had a blue bowl but I think the glaze is too dark for this design. I did pottery wheel throwing demos at the Fair in Cleveland Co. last week. 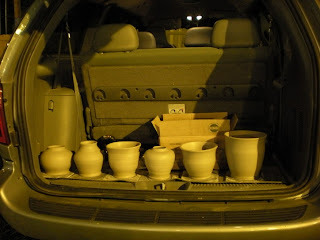 These are a few shots of the midway and the wet pots in the back of my car. They all survived and I am in the midst of carving on them now. 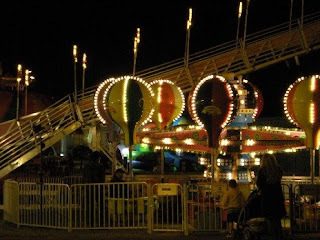 There is something magical about the lights, noise and nippy weather of a fair in the fall. 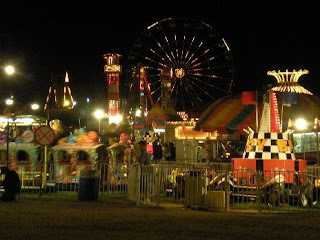 It took me back to my own memories of the excitement of being about 8 years old and going to the state fair in Shreveport, La. with my family and my grandmother. I loved the bobbing ducks (Go Fish) game, where you were guaranteed to win something. I also remember being amazed at the animation of my grandmother, playing about 6 or 7 bingo cards at one time, and me trying to help her keep track of all those numbers. This trio is a continuation of a series based on Persian images. 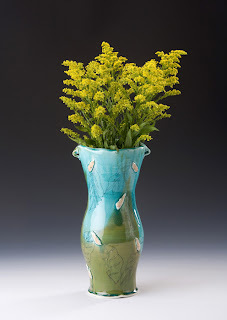 I had done about 20 pieces and fired them in my friend Bobbie's gas kiln and the glazes I used covered the slip so it came out very indistinct and blobby looking. I will give it a go in my kiln and hope my glazes do better with the design. I got to demo at the Cleveland Co. Fairgrounds on Wed. night and will have some comments about driving around with wet pots and some views of the fair in the next post. 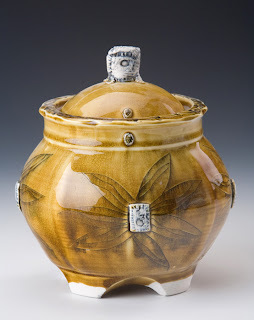 Too many things to say... too many pots still to make... Have a great day! This is one of the painted slip plates I will have for the Open House at the studio on Oct. 18 and 19. The cards are being mailed today. I will have more info on the blog later, but if you want news Right Now, leave me a comment! 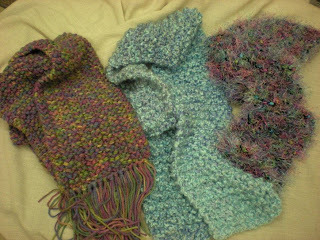 These are definitely a work in progress. I like the background grey color and the plum blossoms but want to work more on my blackbird slip. I have fooled around with adding iron oxide to it and so it has lost some of its darkness. Will go back to the original. That's the amazing thing about making a large body of work. Change is constant for me. People buy things to use and they are getting ideas that are in varying stages of development. I would call this the green grass, full of potential stage. 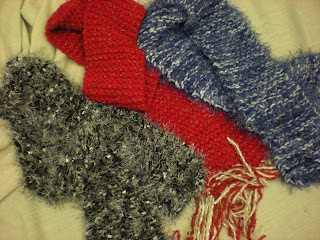 It's very fresh, and I have so many ideas about where I want to go with it. I think these turned out well.